San Juan College was founded in 1956 and has grown incrementally throughout the years to a current enrollment of more than 10,000 students per semester. The Outdoor Learning Center embodies a number of learning opportunities indigenous to the San Juan region and will include a series of demonstration gardens featuring xeric native grasses and plants, working models of wind generation systems, photovoltaic cells, and geothermal forms of sustainable energy. Located in Farmington, the largest city of the Four Corners region, the college is within sight of Colorado’s San Juan Mountains and the desert highlands of Arizona and Utah. The mission of San Juan College is to improve the quality of life of the citizens it serves by meeting the educational and human needs of the entire community in concert with community agencies, businesses, industries and other groups. The Outdoor Learning Center is an ongoing endeavor of the college and it will be a unique confluence of science, culture and community once it is complete. The LSC would like the artwork for this project to communicate and/or demonstrate the aspects of sustainability and environmental responsibility that will make up the design of this Gold LEED (Leadership in Energy and Environmental Design) certified building project. Rae Douglass from Oakland, CA was awarded the commission. 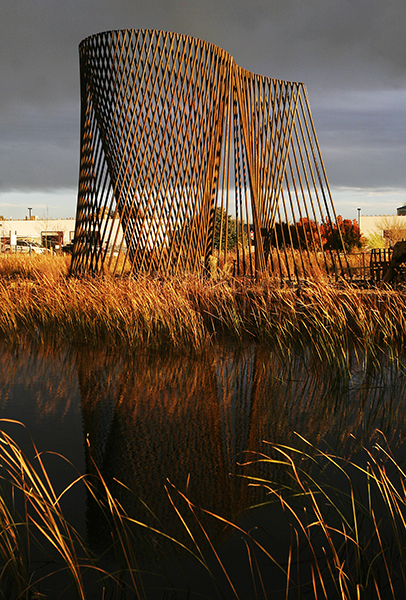 The artwork was installed in November 2010. Designed of recycled steel drilling pipe, “Energy Dance” merges art and industry in an effort to create a balance between energy and beauty. Rae Douglass made every effort to make the work and installation sustainable with the use of local materials. Sixty pairs of pipe are raised in an inverted "V" and arranged in two interlocking crescents that reference symbols of recycling, fellowship, and dance. The arrangement of the pipes and the motion of their shadows create the appearance of movement. A walking path is integrated into the design to encourage visitors to interact with the artwork. Douglass is captivated by the way light defines and transforms spaces. As a patented inventor, he creates and develops innovative processes that guide the execution of his work. A licensed architect, Douglas has created a broad range of art and architecture, including large-scale public projects that have given him an understanding of how to integrate public art into a building site and structure.